When big companies release new software, they launch it with lots of hoopla: press tours, technical conferences, free T-shirts. Open-source projects, even the well-known ones, generally release their major new versions with a lot less fanfare. The FOSS (free and open-source software) community is often too busy coding and testing to bother with marketing, even when the new “point release” of the software is really remarkable. And there are plenty of remarkable open-source applications on the way this year. Quite a few projects are quietly (or not so quietly) working on major releases or significant upgrades that they aim to make available sometime during 2009. I’ve rounded up 25 of the most notable here. There are browsers and operating systems, mobile platforms, development tools, productivity applications, IT administration tools, collaboration software and a few hard-to-classify items. Some of these you’ve heard of; others may be relatively obscure but should give you the wriggly “Oooh, cool!” sense of discovery. You’re sure to feel that one or two really important upcoming releases are missing. (You try paring the list down to a couple dozen candidates!) But the FOSS community spirit can serve here too. Please add your nominations for can’t-miss open-source releases of 2009 to the article comments, including links to the project sites, and we’ll all benefit. 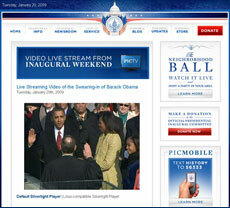 Ten years ago, who’d have thought there could still be so much innovation in Web browsers in 2009? Microsoft Corp. may intend to keep up the pace with Internet Explorer 8, but the FOSS options are at least as compelling. And then there’s whatever Google Inc. is planning for its Chrome browser, based on the open-source WebKit engine. The company is playing it close to the vest, but we do know Mac and Linux versions of the browser are in development. Ubuntu 9.04, the Jaunty Jackalope. Linux fans have much to look forward to, too. Following the release of Ubuntu 9.04, the “Jaunty Jackalope,” in April, the Ubuntu team is planning for Ubuntu 9.10, the “Karmic Koala,” to see the light of day in October 2009. Among the promised new features are integration with the Amazon EC2 APIs, so users can set up their own cloud using entirely open tools, and a kernel mode setting for a smooth and flicker-free start-up. The Ubuntu Netbook Edition will get the latest technology from the mobile Internet project Moblin, including better screen support. Every other Linux distribution is sure to get better, too, along with associated operating system components. For example, openSUSE 11.2, scheduled for November, should include KDE 4.3, GNOME 2.28, Linux kernel 2.6.30 (or higher), a Web-based YaST interface and netbook support. 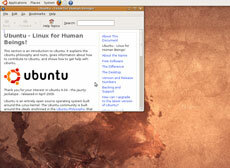 Red Hat Fedora 11 is slated for release by this summer, with several updates. The project’s goals include making Fedora boot and shut down faster (you’d be at the log-in screen in 20 seconds), changing supported architectures and default installed kernels, and improving support for fingerprint readers. It’s easy to keep our eyes focused on the proprietary technologies behind the iPhone and BlackBerry, but the FOSS community elves have been hammering out their own mobile innovations. Android is Google’s software stack for mobile devices, including an operating system, middleware and key applications. The current beta version of the Android SDK, released in early 2009, has tools and APIs for programmers to begin developing applications on the Android platform in Java. Current focus is on support for input methods, such as devices other than physical keyboards. Later this year, Android should get support for displays beyond HVGA. Nobody is talking dates yet, but the entire mobile community is watching. 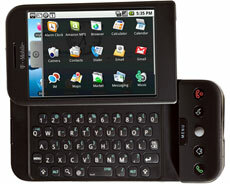 The T-Mobile G1, the first Android-powered device. Maemo is a Linux-based software platform built by an open-source community (with Nokia as its principal sponsor and contributor) to support mobile devices, particularly tablets like Nokia’s N810 Internet Tablet. The Maemo 5 Alpha SDK, introduced in March, has a new UI framework and APIs so developers can build location-aware applications that control vibrations and respond to changes in device orientation. Maemo 5 is also expected to have OMAP3 support, cellular data connectivity and high-definition camera support. For all the delights of Wikipedia, its mobile offering is … underwhelming. Fortunately, Wikipedia Mobile is under active development. The new version (written in Merb) will give you access to Wikipedia on modern 3G mobile devices, such as the iPhone and Android phones, and also will have tailored versions. It’s in alpha testing now and should be released sometime this year. Openmoko, which produced the Neo FreeRunner GSM mobile phone in mid-2008 as a starting point for developers and product designers to build open mobile appliances with integrated communications. Its FreeRunner mobile hardware platform, which includes the Debian and FDOM distributions, the Qt application and UI framework and the Android software stack, lets developers alter the fully operable mobile phone design for their own purposes. Open-source developers understandably invest a lot of effort in improving the tools they use to write better software, whether it’s a programming language, development platform or content management system. This category could have filled up an entire article by itself, but here are a few of the highlights. In December 2008, the communities behind the Web development frameworks Merb and Rails agreed to merge rather than maintaining parallel development tracks. They intend to preserve the flexible configuration and advanced features appreciated by Merb users, along with the rapid productivity and ease of use that has given Rails so much attention from developers. According to the Rails blog, the “overly optimistic” date for the Rails 3 beta is for the Rails Conference in early May, but it’ll be worth paying attention to whenever it arrives. Dojo 1.3, now in RC1 and expected to be final very soon, has a collection of fast and concise DOM manipulation APIs, a more configurable NodeList class, a brand-new lightning-fast CSS Selector query engine, and new widgets and components. Moonlight is an open-source implementation of Microsoft’s Silverlight, a browser plug-in for streaming video and Internet apps. The result of a technical collaboration between Microsoft and Novell Inc. and related to the open-source .Net implementation Mono Project, Moonlight is primarily for Linux and other Unix/X11-based operating systems. The Moonlight community has access to Microsoft’s test suites for Silverlight and distributes a media pack for Linux users with licensed media codecs for video and audio. Moonlight 1.0 was just released in February, and work is already under way on Version 2, to keep it in sync with Silverlight. Watching the presidential inauguration via Moonlight. In fact, it’s worth calling attention to Microsoft’s active open-source involvement simply because so few imagined that Microsoft would ever show up at the party. Among the successes is IronPython, a Python implementation designed to run on .Net and Mono; Version 2 was released in February. Now that that’s done, the team can turn its attention to an IronPython version to support Python 3.0. While the team is vague about a release date (“after 2.x is out the door,” according to a spokesperson), it will likely arrive sometime this year. Microsoft also created IronRuby, a Ruby implementation for .Net, and the Dynamic Language Runtime, a set of shared services for implementing dynamic languages on .Net. All three projects are distributed under the terms of the Microsoft Public License. The MariaDB project, a community-developed branch of the MySQL database using the Maria storage engine; the brainchild of Michael “Monty” Widenius, founder of MySQL AB and Monty Program AB. Eclipse Galileo, a coordinated release of different Eclipse projects, due to ship at the end of June 2009. Most of the preceding projects are of interest mainly to geeks (and we mean that in a nice way). Increasingly, though, businesses are adopting open-source software for productivity use and line-of-business applications. Primary among these is the open-source “replacement” for Microsoft Office. OpenOffice.org 3.1, expected imminently, is currently available as a “developer snapshot.” It promises grammar checking, anti-aliased drawings, improved charting and better outline features. 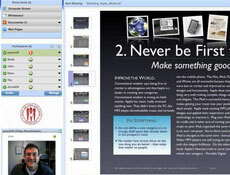 That’s on top of the new features from Version 3.0 (released in October 2008), including compatibility with ODF 1.2 and OOXML and native Mac OS X support. The OpenOffice.org 3.1 developer preview. But business-quality open source isn’t limited to traditional desktop apps or enterprise software. Kaltura is an open-source platform for creating and viewing video applications. It’s aimed at Web publishers, integrators and application developers. Kaltura currently has extensions for several platforms, including content management (such as Drupal), blogging (WordPress) and collaboration (MediaWiki). In the second quarter of 2009, Kaltura’s Community Edition will be launched under the GNU General Public License, allowing any Web site to build its own YouTube-like video portal, fully independent of Kaltura. Optional enterprise support includes streaming and hosting, ad serving and content syndication. Dimdim claims to be the first open-source Web meeting company; its software has been downloaded nearly half a million times. Among its existing features are unlimited use, multiparty video and audio conferencing. Dimdim has big plans for 2009 (though it didn’t get more specific than that on timing), including a commercial version. The Dimdim open-source platform will become a full webinar product, allowing meetings of more than 1,000 participants, which will make it attractive to anyone who needs to conduct general meetings or training sessions. LedgerSMB, a fork of the SQL-Ledger accounting package aimed at small businesses. Its rapidly approaching 1.3 release promises better contact handling and security that integrates with a company’s network security infrastructure, such as Kerberos. The Lucid Desktop (formerly the Psych Desktop), a Web desktop (maybe a Web operating system) that integrates with the Web, existing desktop technologies and mobile devices, acting as a portable, online workspace to store files, play media and manage your office documents. Version 1.0, still in beta, is overdue, but it shouldn’t be long now. For IT administrators, the most exciting release this year may be Samba 4.0, which is supposed to have active directory support, an internal Kerberos server and full NTFS semantics for sharing back ends. You might have heard all that before, as Samba has been stalled for a while, but the development team is actively working on it now, and there’s a new build as of late February. You can certainly expect action in the configuration management space — tools that help system administrators get more work done, faster and more consistently. Among them is Reductive Labs Inc.’s Puppet 1.0, due to be released sometime in 2009. Reductive Labs intends to fully rewrite Puppet’s networking functionality, as well as optimize modeling, language enhancements and reporting. Preliminary testing shows the server will be about three times faster with a memory footprint that’s a third of its current size, says a project spokesperson. In April, Zenoss Inc. will release Version 2.4 of Zenoss Core, its open-source monitoring and systems management suite, with a new dynamic Web-based user interface and with agent-less Linux and Unix command-line collection via SSH to improve system-level monitoring. The group will also launch a Zenoss community collaboration platform, Zenoss.net, for users to submit and share network monitoring and management best practices and Zenoss extensions. These aren’t the only new and improved tools for IT admins. Longtime Unix configuration tool Cfengine, which bills itself as “autonomous engineering for the data center,” is now in Version 3.0 and backed by a commercial support company; an enterprise edition is planned for this year. Enomaly Inc.’s Elastic Computing Platform, a programmable virtual cloud infrastructure. Version 2, now in alpha, includes a Web services API, automated VM deployment with Elastic Valet and multiserver support. OpenQRM, a suite of data center management tools that may excite people dealing with configuration management and other administrative tasks in the cloud. As an example of the work under way, Version 4.4 (just out) includes remote control for the cloud using a SOAP Web service. Don’t you hate it when perfectly good descriptive terms become buzzwords? That’s been the case for “collaboration tools” and “content management” and maybe (just maybe) “knowledge management.” These are useful categories, but the terms are so mushy that the products become hard to describe. We humans are pretty good at creating meta-tools for organizing, sharing and presenting data … and that’s what this category is about. Nevertheless, content management fans will find plenty to keep themselves occupied. 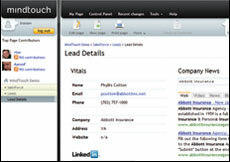 MindTouch Deki is an open-source application for enterprise collaboration that sports a wiki-like interface. It allows users to organize raw data into actionable information and ensures that it’s dynamically updated from disparate, disconnected data sources. Slated to be released in early 2009, MindTouch Deki Lyons will expose more ways to interact with the core Deki application by coupling Deki’s traditional mashup strengths with new tools for developers, such as the ability to trigger actions based on activity inside Deki or use a built-in local storage mechanism. A MindTouch Deki Lyons mashup. Foswiki is enterprise-ready wiki software that’s a fork of TWiki (which has apparently moved its attention toward commercial products), initiated by former developers and users of the TWiki project. They just released Version 1.0 in January and are under way on 1.1, aiming to improve usability as well as interaction with updates in skins and plug-ins. Version 2.0, also planned for this year, will give attention to performance and scalability. 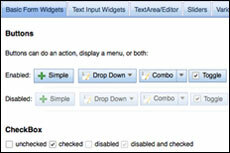 WordPress has grown to be more than a blogging system, with all sorts of plug-ins to extend its functionality. Version 2.7 just shipped, and Version 2.8 is under way with its top priorities widget management, theme browser/installer and performance upgrades. Beyond that, WordPress 3.0 is scheduled for August. Among the neatest things about open source is that its philosophy of collaboration isn’t limited to strict “applications.” Here are a few examples of work under way that may make a difference beyond ones and zeroes. 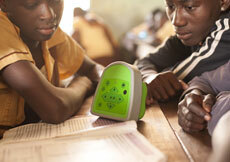 A Talking Book Device in a Ghana classroom. Literacy Bridge created the Talking Book Device, an open-source digital audio player and recorder specifically designed for people living in poverty. Over the short term, Talking Book Devices will serve as mechanisms for the rapid and free distribution of essential, accurate information via device-to-device sharing. Over the long term, say its organizers, Talking Books facilitate literacy learning. A pilot project was launched in Ghana early in 2009, enabling undergraduate students at MIT and other volunteers to collect information regarding device functionality and durability. Literacy Bridge isn’t the only company extending open source to the hardware realm. For instance, SparkFun Electronics is also providing “open-source schematics” for its microcontrollers, such as the LilyPad wearable technology — the next iteration of the “wearable computer.” Since these boards are meant for hobbyist experimentation, the definition of “wearable technology” is left up to you. It’s released under the Creative Commons Attribution ShareAlike license, so you can download all the engineering files and hack on the hardware to your heart’s delight. EveryBlock is a microlocal news Web site funded by a grant from the John S. and James L. Knight Foundation. It has a distinctive approach to local news: You enter an address in one of 11 U.S. cities to see the news immediately near you. In June, the EveryBlock team will open source its publishing system, so that any news organization, government or citizen can create an EveryBlock-ish site for its own town. Whew. That’s quite a pile of cool open-source software (and hardware!) to look for in the coming year. Nonetheless, there’s a good chance that you’re thinking how unfathomable it is that I left out your favorite project, which is apt to change the face of computing. Groovy — it’s time to share it with the world. In the article comments, tell us about the open-source release you’re most looking forward to seeing this year, and why it’s such a big deal. Esther Schindler has been writing about technology since 1992. She has a tropism for techie topics that make other people’s eyes glaze over — particularly software development, operating systems and open source. Steven J. Vaughan-Nichols, a Computerworld columnist, provided extra reporting on this article.